As we write, the much-cherished Great Barrier Reef is experiencing the devastating effects of coral bleaching. The Great Barrier Reef Marine Park Authority has declared severe coral bleaching underway on the reefs north of Cooktown. El Niño and climate change have driven record-breaking temperatures worldwide. 2015 was the hottest year ever, and 2016 has continued the trend. February 2016 was 1.35℃ above average temperatures calculated between 1951 and 1980, the hottest month by the biggest margin ever. Sea temperatures have also been at record-breaking levels. In the oceans, we have known for more than a decade that rapidly warming ocean temperatures present a serious threat to coral reefs, the world’s most biologically diverse ecosystems. The latest changes in average global surface temperature, if they continue, suggest that coral reefs like the Great Barrier Reef may significantly change even sooner than previously predicted. The first sign that a coral reef is in trouble from underwater heatwaves is a sudden change in colour, from brown to brilliant white (bleached). It only takes a temperature increase of 1-2℃ to cause entire reefs and regions to bleach. Small changes in sea temperature disrupt the special relationship between corals and tiny marine algae that live inside their tissue. These algae supply 90% of the energy corals that require for growth and reproduction. When corals bleach, they expel the algae. If conditions stay warm for a long time, corals start to die either directly or indirectly from starvation and disease. Loss of corals is coupled to the loss of fish and other organisms that ultimately determine opportunities for tourism and fisheries for hundreds of millions of people around the world. Mass coral bleaching was first reported in the early 1980s. Before that, there were no scientific reports of corals bleaching en masse across entire reef systems and regions. Did scientists accidentally overlook earlier bleaching events? With a rich history of coral reef ecology going back to the 1930s at least, the idea that we would have missed one of the most visual changes to coral reef seems implausible. It also seems odd that filmmakers such as Valerie Taylor and Jacques-Yves Cousteau could have also missed filming these spectacular events. The first global bleaching event was recorded in 1998. In the lead-up to that event, strong El Niño conditions developed on top of already warm ocean waters in the Pacific. During the 1998 event the world lost 16% of its coral reefs. Reports of record levels of coral bleaching in the eastern Pacific began to pour in during late 1997. This was followed by bleaching reports in the South Pacific and the Great Barrier Reef in February and March 1998. A month or so later, coral bleaching was reported across the Western Indian Ocean and, as the northern hemisphere summer unrolled, coral reefs in Northeast Asia, the Middle East and Caribbean began to bleach. A second global event was recorded 12 years later in 2010, with the third global event happening now. The new reports of severe bleaching – and the associated patterns of ocean temperature – are hauntingly similar to the 1998 event (see Figure 4). Our team at the Global Change Institute at The University of Queensland have documented extensive coral bleaching in Hawaii in November 2015, and in Fiji and New Caledonia in February 2016, as part of the XL Catlin Seaview Survey. On cue, the Great Barrier Reef has undergone serious bleaching – albeit in a different sector to the 1998 event. While we had our suspicions that the reef was going to bleach based on the temperature predictions, we were hesitant to say exactly where and precisely when – weather ultimately determines which parts of the reef will bleach. The bleaching is currently focused on the pristine reefs north of Cooktown, driven by water temperatures that have persisted at 1.0-1.5℃ above seasonal averages since mid to late January 2016, and calm and still weather conditions over recent weeks. We don’t know for sure how the rest of the 2016 bleaching event will unfold. Based on what we have seen so far, our suspicion is that this event will follow similar broad geographical patterns to that seen in 1998, modified by local weather patterns. It is likely that we will start seeing reports of widespread mass coral bleaching and deaths in the western Indian Ocean from countries such as the Maldives, Kenya and the Seychelles, with Southeast Asia and the Coral Triangle centred on Indonesia following soon afterwards. As the northern summer develops, coral bleaching and deaths may be seen in parts of the Middle East, Japan and the Caribbean by July and August. The Great Barrier Reef is bleaching at the same time of year (within a few weeks) as it did in 1998. Back then, around 50% of the reefs on the Reef saw bleaching. In 2002 – not a global event – around 60% of its reefs showed bleaching on central and inshore areas as opposed to the more even distribution observed in 1998. In both these bleaching events, coral deaths ranged from 5-10%. 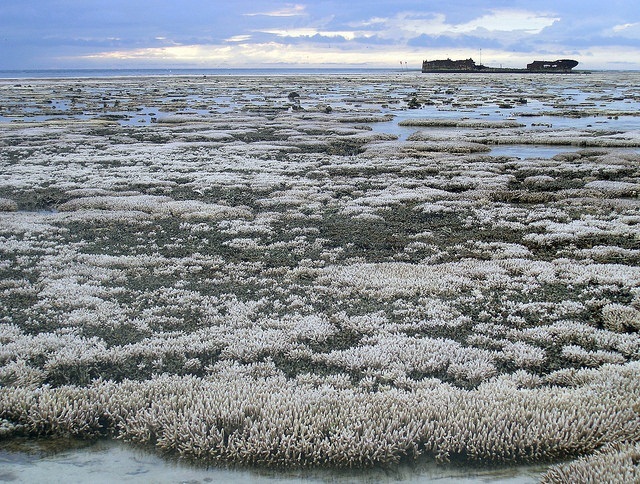 A localised bleaching event with significant coral deaths (around 30-40%) was recorded in 2006 in the Keppel Islands on the southern end of the Reef. Outside these events, there has been isolated bleaching on the Reef since the early 1980s, although the extent has never approached the recent extent and intensity. In recent years, we have wondered whether the Great Barrier Reef was somewhat immune to large-scale impacts that have occurred elsewhere in the world. For example, while huge impacts were being felt in Southeast Asia and elsewhere, the Great Barrier Reef effectively dodged a bullet during the second global bleaching event in 2010. It had also been speculated that the northern sector of the Reef, with its more pristine coastal forest and river catchments, might be more resilient to the impact of climate change. This is backed up by the observation that the abundance of coral has remained stable in the northern sector of the Great Barrier Reef, whereas the central and southern sectors have declined by 50% over the past 27 years. The speculation is now resolved. It is very clear from events of the last week that even the most pristine coral reefs (such as those in the northern sector of the reef) are as vulnerable as corals anywhere else. This demonstrates that the failure to act decisively on climate change will negate any attempt to solve the more local problems of pollution and overfishing. The recent coral bleaching events underscore the importance of adopting the pledges made ahead of the 2015 Paris climate conference - and indeed going even deeper. This is a time for action, not business as usual.